In this Aug. 15, 2016 file photo, US Vice President Joe Biden listens as Democratic presidential candidate Hillary Clinton delivers remarks in Scranton, Pennsylvania. Former Vice President Joe Biden is tiptoeing toward a potential run in 2020, even broaching the possibility during a recent gathering of longtime foreign policy aides. Huddled in his newly opened office steps from the U.S. Capitol, Biden began a planning meeting for his new diplomacy center by addressing the elephant in the room. He said he was keeping his 2020 options open, considering it a real possibility. He insisted he had made no decision, and didn't need to yet, according to five people who either attended the meeting or were briefed on it by those who did. Biden also expressed interest in bringing those in the room onto his team if he decides to launch a campaign. At the same time, he gave them an out: There would be no hard feelings if they decided they were content in their current roles outside of government, said the people, who demanded anonymity to discuss a private meeting. The political world has long tried to game out Biden's plans for 2020. After all, he came close to running last time only to see President Donald Trump pull off a victory that many Democrats openly suggest wouldn't have happened had he, not Hillary Clinton, been their nominee. 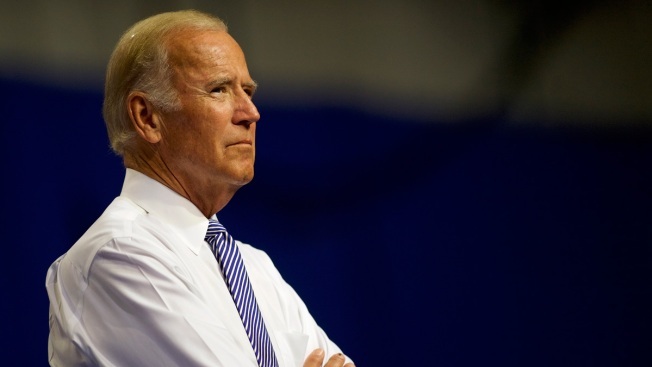 Several people came away from the meeting with the impression that if no strong Democratic candidate emerges in the next year or so, Biden would feel strongly compelled to run. A presidential candidate twice before, Biden would be 78 on Inauguration Day if elected in 2020, a concerning prospect for some Democrats even though he's only a few years older than Trump. One possibility that Biden's longtime advisers have discussed privately is that he could announce his intention to serve only one term, clearing the path for his running mate to take over in 2024 and potentially setting up Democrats for a 12-year White House stretch. Biden's brief discussion about his 2020 deliberations came as he brought foreign policy staffers together to set the 2018 agenda for the newly opened Penn Biden Center for Diplomacy and Global Engagement — where many of them are now working, including Colin Kahl, his vice presidential national security adviser, and Steve Ricchetti, his former chief of staff. Eli Ratner, his former deputy national security adviser, and Mike Carpenter, the former Pentagon and State Department official who's now the center's senior director, also attended, as did Julianne Smith, a Biden adviser in the Obama administration's first term who now works at the Center for a New American Security, a Washington think tank. A Biden spokesman declined to comment. But in a recent NBC News interview, Biden said he'd decide on running in 2020 based on whether it was "the right thing to do." "I'm focused on one thing: electing a Democratic Congress to stop this erosion of the core of who we are," Biden said. "I'll look at that a year from now. I have plenty of time to consider whether or not to run." The meeting was one of several signs that Biden is beginning to position himself as an alternative to Trump. Biden has started denouncing the current president's leadership more frequently in public, as he crisscrosses the United States and beyond to promote his new book, his cancer initiative, his new domestic policy institute in Delaware, the diplomacy center and his new political action committee, American Possibilities. He's also been gearing up to play a major role campaigning for Democrats seeking to retake the House and Senate in the 2018 midterms. "Donald Trump's looking out for Donald Trump. Republicans are looking out for Donald Trump. Who's looking out for everyone else? Democrats," Biden wrote in a recent fundraising pitch to the PAC's supporters. He said in 2018, he would "beat a path all across this country to stand up for leaders who will stand up for all of us." In 2015, Biden's face was plastered across cable news channels and newspaper front pages for months as he carried out a lengthy deliberation about whether to challenge Clinton for the nomination. Ultimately, he decided he and his family weren't in position to run so soon after his son, former Delaware Attorney General Beau Biden, died from brain cancer earlier that year. Yet many Democrats have argued that his "everyman" brand and blue-collar appeal would make him particularly well-suited to challenge Trump.